Homeostatic adaptations in pregnancy provide for the needs of the developing fetus while preserving the ability of the mother to adjust to changing environmental demands. Signals from the conceptus adjust the setpoints of feedback mechanisms that govern cardiovascular, renal, and respiratory functions. Bidirectional exchange of gases and metabolites between fetal and maternal blood takes place across the large surface area of the placental villi. The uteroplacental circulation receives about 20% of the maternal cardiac output. Hormonal signals from the developing placenta decrease the sensitivity of vascular smooth muscle to vasoconstrictor agents and lower peripheral resistance and arterial pressure. Resting maternal cardiac output increases by 50% as a result of decreased peripheral resistance and increased blood volume. 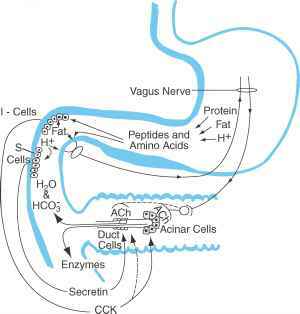 Activation of the renin-angiotensin-aldosterone system results in sodium retention and expansion of plasma volume. Increased osmoreceptor sensitivity leads to increased thirst and decreased plasma osmolality. The increase in plasma volume dilutes erythro-cyte and albumin concentrations, thus decreasing the hematocrit and colloid osmotic pressure. Decreased glomerular arteriolar resistance increases renal blood flow and glomerular filtration. High blood levels of progesterone increase chemoreceptor sensitivity to carbon dioxide and increase inspiratory drive. Hyperventilation decreases alveolar and plasma PCO2 and increases blood pH. Decreased PCO2 in maternal blood facilitates placental gas exchange.